Who said sweatpants are just for lounging around? 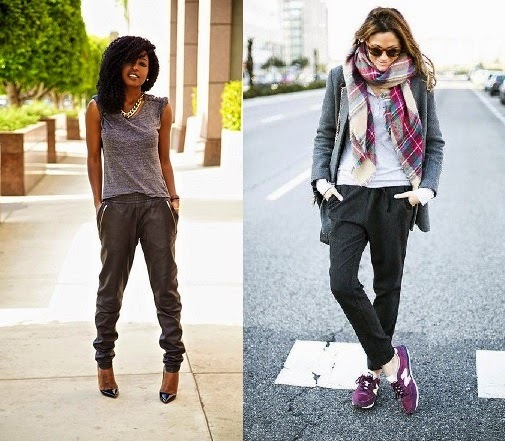 Jogger pants are must-haves this fall! These updated jogging pants are super comfortable and are a great alternative to leggings. Whether you’re relaxing at home or going out, you can dress them up or down. Just pair them with a graphic t-shirt or cropped top. I’m happy to say that the 1970s trend is back - bell bottoms! Get away from those skinny jeans with this hippie chic and sophisticated style! Dress it up with a white button down or make it more casual with a cropped sweater or peasant blouse. You have to try this boho chic trend! Harem pants became very popular this summer but why not carry the trend into fall? They are super versatile - patterned ones are perfect to wear to class while solid black ones could be worn on a night on the town. Pair them with sneakers to get a sporty look or with booties to get a classic look. Which trend are you going to try this fall?